Sending invoices and getting paid via PayPal is easy with Direct Sidekick! To link your account to Direct Sidekick you first must have a PayPal business account. Don’t have one? See how to upgrade to PayPal business. 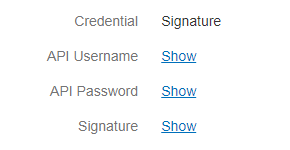 Click Show for each of the items listed and copy your Username, Password and PayPal Signature to the Payment Gateway form in your Direct Sidekick Finance Settings page. Click Submit in Direct Sidekick.